Special Summer Festival Wedding offer to welcome in the Summer, with festoon lighting and garden party furnishing bundle for the ultimate Summer Wedding Festival. And who does not like a Kombi which is also the ultimate photo booth!!! Yay! Gaze at the view out to the Sunshine Coast and Noosa from your private estate for a day, festival wedding of relaxed style in an ocean breeze as your reception flows inside to out. QUOTE SUMMER FOR YOUR SPECIAL OFFER of styling bundle and Kombi Photo Booth Inclusions. Festival Foods.Beverage Package. Florals + Styling Bundle. 2 hour Kombi Photo Booth offer. Thinking of being outside in summer but want the Best plan B just in case, with the use of our fully covered walkways and outdoor pavilion on the edge? No pesky place cards or extra formalities unless you want them, make your entrance, decide to have speeches or simply a thanks for coming and sharing with us toast and party the night away with time to relax and enjoy. 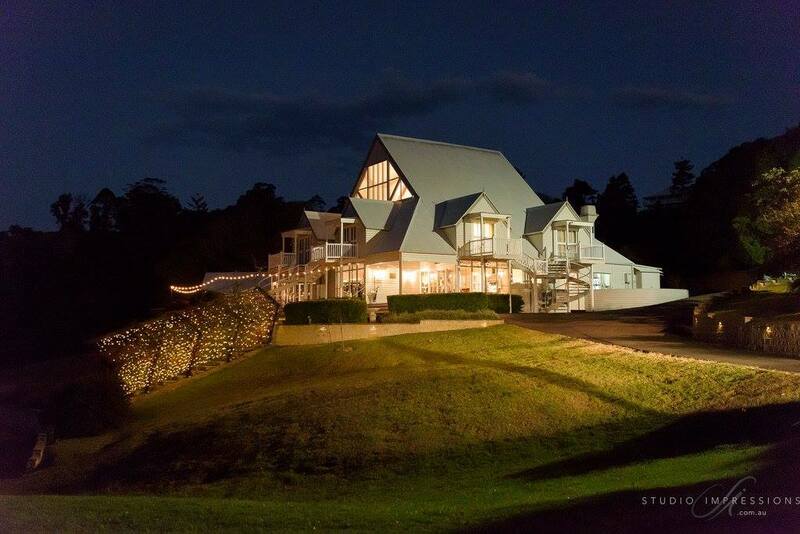 Come to the Hinterland of Maleny where the ocean breeze flows up into the valley and your guests can flow though the venue looking out to the festoon lights and the Sunshine Coast, Queensland. Casual, relaxed fun vibe with all the elegance and abundant festival foods with cold beers and cocktails. Use our expansive grounds and outdoor pavilion and go with the flow from inside to out in your own summer time wedding vibe should you wish to engage a full style concept and the tipis you can add your own extras and go totally boho. Dancing and indoor bar are together, centrally located in the Manor which opens to the walkways and outdoor areas, the “Supper Club” is setup near the dance floor, so your guests can graze, dance or move through the venue to outside in a relaxed elegant party style. Everyone knows boogie and bar go together but then your guests can flow from inside to out taking in all the views and the beautifully lit surrounds… if lights are your thing you will love it! Ceremony grand locations can be on the Plateau, the Pavilion, the Main Lawn or under the Love Tree. Dining can flow through all the spaces and the Manor, the Manor main Lawns and Pavilion in a roving style, or be served in share fare banquets the whole length of the walkway and pavilion a sit-down option, or you may decide on a formal sit-down dining option in the Manor. Dance party time and our “Supper Club” are setup in the Manor, our dance floor opens onto our outdoor/indoor bar which allows you flow through the venue. Create your Summer Festival Wedding event from outside to in…party in the summertime with the experience of Maleny Manor voted 7 times Best Reception Venue in Queensland. 2 Wooden trestle tables with 8 x Maleny Manor white chairs for the walkway or inside or outside…you decide. Festoon Lighting is included around the building and grounds. Award winning Coordinator as your host and assistant in pre wedding plans ・ Use of air-conditioned boudoir powder room or full loft area ・ Complimentary Bride and bridesmaids sandwiches ・ We require that all accommodation is taken at the Manor. Use of Manor house estate for your photo shoot. Mixture of large and small clothed cocktail tables. Dessert Bar Table .Present table ・Elegant upholstered chairs ・ Bridal Table decorated with skirting should you still like a formal bridal table・Use of Manor Lounge Inside. Cake Table and Knife. Wedding reception styling using gorgeous cocktail floral designs with a abundance of creative floral concepts to choose from. Tea lights and small arrangements or vases with flowers on the small cocktail tables placed in the garden first then into the room. No Bonbonniere with this style as there are no table settings which means no place cards to place either. 9 cocktail arrangements 90 guests .8 cocktail arrangements for 80 guests. 7 Cocktail arrangements for 70 as your style may flow from inside to out. Extend this package by 1hr + $15 per person extra. Heavy and Light Beers . Great Northern. Hahn Super Dry. James Boags Premium and Light. XXXX Summer and XXXX Gold. *Note see T&C’s information package booklet, not available with any other special or offer or on public holidays. *Note No Bonbonniere included this special package and it is not a traditional seated styling but a wedfest boho relaxed theme. *Note Lovebirds Weddings is the only company we use for our styling re our install and bump out plus planning operations. *Please Note – You arrange the Tipi if that is your design concept. Due to the intensiveness of the setup for the Tipi’s we can only provide this feature normally on a Friday in peak seasons or by special arrangement Saturdays and Sundays in Summer. Acoustic sound only in the grounds. Dancing, DJ’s, Bands and Bar must remain inside venue but the venue does open up fully in Summer and your guests will flow though the full venue and out into the pavilion and grounds.